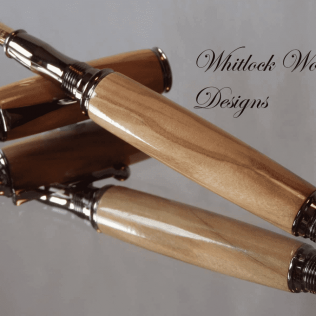 This is a wood pen set hand turned in my UK workshops on a wood-turning lathe. They both have a high-quality gold-plated trim and black detailing. English Yew (Taxus baccata) is an old and ancient tree with some over 2000 years old. Commonly found on or near pagan burial sites, everything from the tree is poisonous apart from the aril. Yew rich in colour from pale cream sapwood to rich golden browns and sometimes purple if there has been any iron in contact with the wood. The mechanical wooden pencil has a superior twist mechanism to extend and retract the 0.7mm lead. 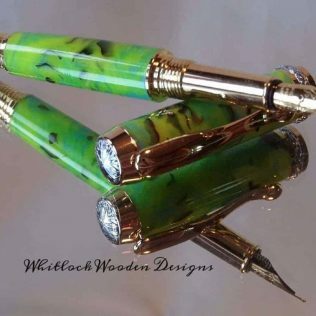 Normally on this type of pencil design, the lead just extends making this design far superior. With the wood mounted on my lathe and turned to round and shaped. Once shaped it needs sanding through to 400 grit and then up to 8 coatings of ca glue finish applying. This then needs polishing to 12000 grit using micro mesh for a super hard and durable high gloss finish. 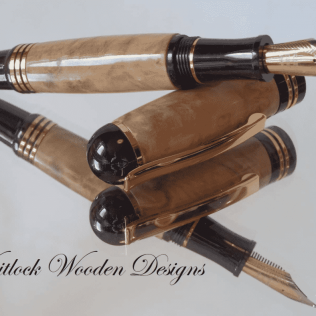 The wood needs sealing with a durable finish, not the wood turner’s traditional friction polish or wax as these are not durable enough for daily use. Sealing the wood will prevent the natural oils from the skin staining and discolouring this beautiful wood. 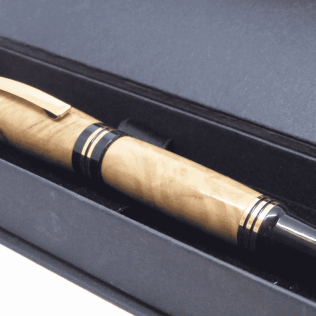 The fountain pen from my European range, with a good quality medium nib. 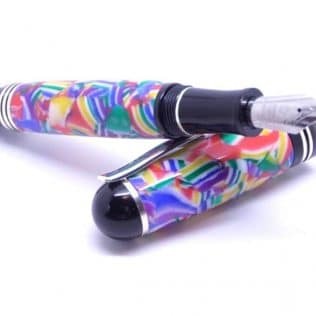 Supplied with a converter pump for bottled inks and an ink cartridge to get you started writing straight away. 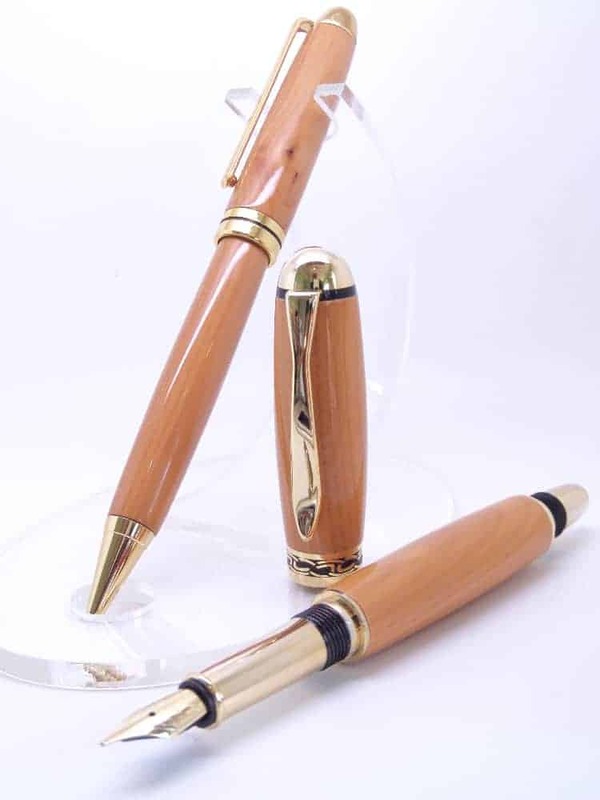 The pen has a posted cap, so you can screw the cap onto the end of the pen affecting weight and balance. These gift sets come in a presentation box as a standard. 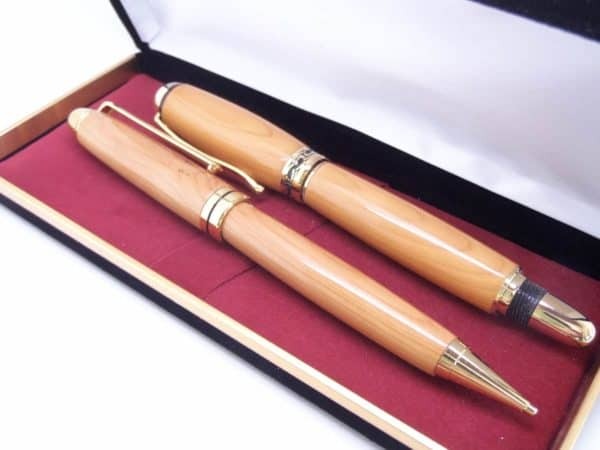 As every piece of wood different, this set will make unique wooden gifts for 5th wedding anniversary, Father’s Day or Christmas gifts.